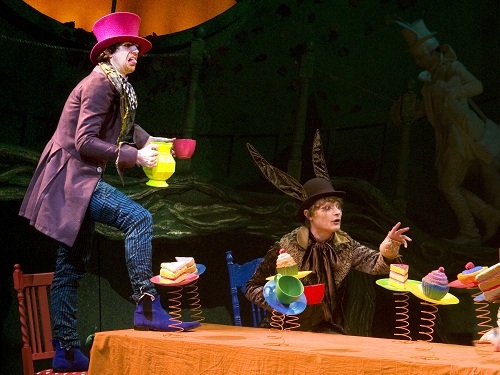 Over the last term the Technical Youth Theatre has been recreating the table from the Mad Hatters Tea Party, it was essential for us to keep the design true to the original table in the show by Simon Higlett. Our first task was to cut out our cakes shape from large blocks of polystyrene; during this process we learned how to use saws to shape our cakes along with metal cutters to create our own unique shapes. Next we had to sand the edges and sides of our polystyrene shapes to give each one a smooth surface and then indent any areas, to create the centre of a cake for example or to show a bite in the side of it. After this we learnt how to scrim our cakes. Scrimming is done by covering our cakes in a layer of glue mixed with water, then putting thin pieces of white material over the top to cover the whole cake. The cakes needed 3 layers of scrim. When all of the layers were dry we started to paint our cakes for example painting a cupcake pink with a yellow top or painting each part of the cake a different colour to represent a different flavour. Then lastly we attached each of our cakes to a spray painted spring on the table and then cable tied them to ensure they were secure. 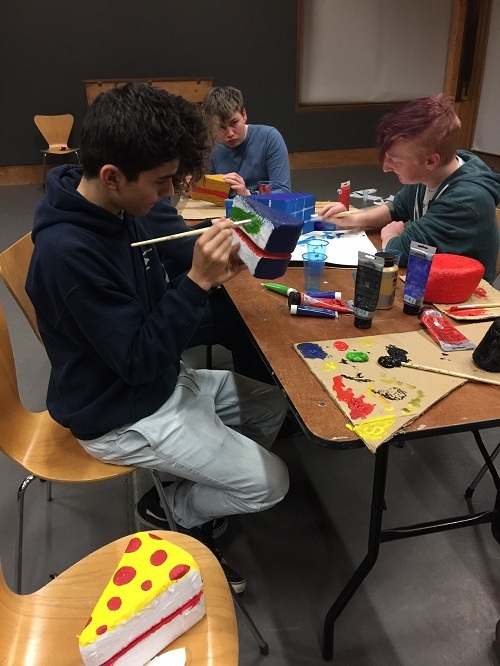 In Technical Youth Theatre you learn so many different new skills, from creating a prop for a show, all the way through sound, LX and stage management. Chichester Festival Theatre is all about producing new work and creating the next generation of professional actors and technicians. 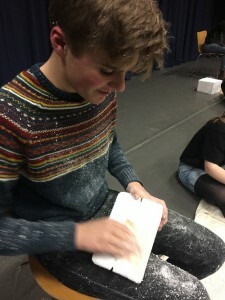 Technical Youth Theatre is allowing me to gain the unique skills I need to work in this industry. It is the best essential course for any young person who wants to succeed in a career in theatre.